Waterloo, Ontario, March 12, 2019 /PRNewswire/ -- Virtek, recognized by top-tier aerospace manufacturers around the world for best-in-class laser positioning solutions, will showcase its newest High Visibility Laser Projector and new Positioning Mount at JEC 2019. 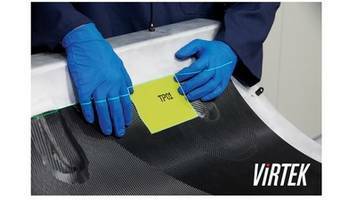 The Iris™ 3D with Vision Positioning System (VPS) enables aerospace manufacturers to streamline composite ply layup, paint masking and a host of other labor-intensive tasks. The new system delivers superior laser line visibility, even in bright ambient lighting environments and on difficult work surfaces, helping to accelerate the composite lay-up process. Visitors to the show will also witness the debut of Virtek's new Positioning Mount, an innovative remote-controlled option that optimizes the system's projection by repositioning the laser on challenging tools or larger work areas. It enables users to pan and tilt the VPS and provides six times more projection coverage than a conventionally mounted laser projector. Improve worker productivity and reduce costs. "Lasers bring a high level of efficiency and quality to assembly tasks," explained Sean Francoz, Virtek's Group Product Manager, "but they can be difficult to see under bright lighting conditions or on challenging composite surfaces. Virtek's new High Visibility Laser Projector enables operators to easily locate laser lines and get the job done faster." And, because Virtek's high visibility Laser is certified laser safety class 3R, it eliminates the need for manufacturers to incur additional expenses related to employing on-site safety officers, supplying protective eyewear and providing extensive safety training. The Iris 3D vision and positioning system locates parts in 3D space and then boldly and precisely projects a laser template onto the mold or part to guide operators through the fabrication process. Virtek's integrated FlashAlign™ technology eliminates the need for workers to align laser targets manually, thereby streamlining the initial set up process and improving worker productivity. "In fact, Francoz, added, "one Fortune 100 company reported initial alignments up to 20 times faster and re-alignments reduced from minutes to seconds." A compact footprint optimizes use of manufacturing space and a portable frame offers flexibility. Virtek understands that manufacturing space is costly and manufacturing layouts change as companies transform. That's why the Iris 3D system is ultra-compact and portable. Trusted by aerospace manufacturers for more than 30 years. Virtek's team of experienced professionals developed the first projection systems capable of meeting the rigorous precision requirements required by aerospace manufacturers. Today, Virtek's experienced service technicians install and calibrate each Iris projection system and customize operator training to meet each organization's unique process needs. Customer support centers across the globe ensure users achieve maximum productivity throughout the lifetime of their Virtek system. Virtek Vision International ULC is the global leader in 3D laser templating, positioning and quality inspection systems for manufacturers around the world. The Virtek name has become synonymous with innovation, accuracy and reliability. Innovating since 1986 and based in Waterloo, ON, Canada, Virtek has local sales and service coverage across North America, Europe and Asia. The world's largest manufacturers in aerospace, construction, metal fabrication, and renewable energy trust Virtek. See things differently with Virtek solutions – Iris™, LaserEdge®, LaserQC® and TrussLine®.